Newsweek itself, at least its print edition, may soon shuffle off its mortal coil. You can see the editorial thought process at work. What kind of cover story could create the sort of pop that the classic “Wimp Factor” cover did? Then inspiration struck: How about another “Wimp Factor” cover? 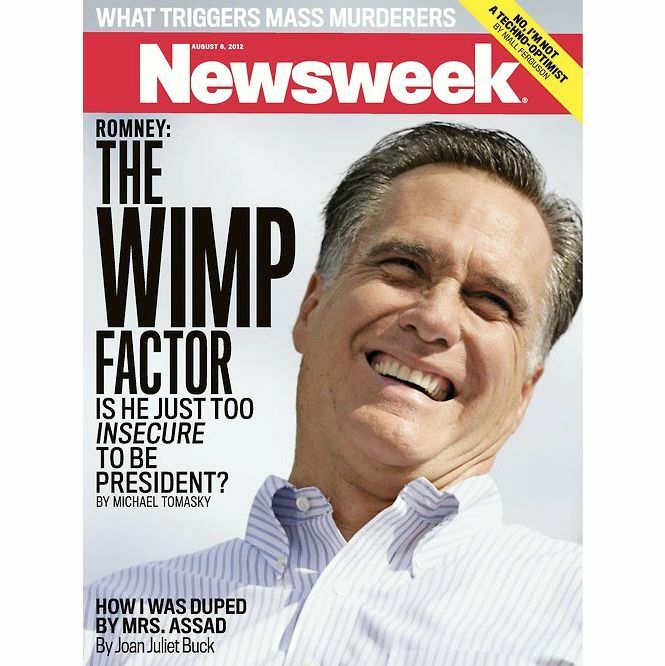 And so this week’s edition of Newsweek reprises the cover line, only applied to Romney. The affiliated Daily Beast website also has an item “Reliving History” of that great moment in its past. It calls to mind the old Saturday Night Live skit with the director who strikes gold with Soylent Green (an actual movie about a mysterious food that turns out to be made of people) and then attempts to recreate the success with a series of progressively less-successful follow-ups Soylent White, Soylent Teal, Soylent Cow Pies, Soylent Stooges, before, finally, returning to his roots with Soylent Green 2. The latest edition of Soylent “Wimp Factor” is churned out by the estimable Michael Tomasky, who (I would surmise) gamely tries to fit the facts into the hackneyed premise, but winds up disproving it. The difficulty begins with the lead anecdote of the piece, which has to be on the news. The latest news about Romney, of course, is (or was, as of press time) his insult of the London Olympic Games. “The episode highlights what’s really wrong with Romney. He’s kind of lame, and he’s really … annoying,” the story assures us. Except, of course, that gratuitously insulting your hosts while subtly implying you could do their job better, whatever else is wrong with it, is the opposite of wimpiness. It leans on the power of invidious comparison: “Where Reagan saddled up a horse with the masculine name of El Alamein, Mitt saddles up something called Rafalca — except that he doesn’t even really do that, his wife does.” The “except that” clause is written as if it somehow amplifies the charge, wheras in fact it nullifies it completely. Here, let’s try this method to argue that, I don’t know, Tom Brady isn’t manly. Ready? Where Johnny Unitas once pounded beers in working class bars, Tom Brady promenades down fashion runways in a dress — except that he doesn’t even really do that, his wife does. The story cites Romney’s teenage bullying and asks, “What kind of teenager beats up on the misfit, sissy kid, pinning him down and violently cutting his hair with a pair of school scissors”? A mean one? Certainly. But not really a wimpy one. The story cites Romney’s objection to a moderately tough line of questioning from Fox News: “A politician complaining about a journalist just doing his job is … weenie-ish.” No, it’s aggressive! A wimp would simply accept that journalists might ask questions he doesn’t like. It also notes Romney’s aggressively hostile shot at Obamacare in front of the NAACP — “an easy shot aimed at people who aren’t voting for him anyway.” The premise here, again, is that nastiness and aggression are evidence of wimpiness, which distorts the term beyond all plausible meaning. It would be far easier to turn the opposite behavior in all these cases into evidence of wimpiness — having been bullied as a youth, abandoning your standard denunciation of Obamacare in front of a black audience, not trying to push back on tough questioning. The article notes high up that its 1987 cover caused a “Huge stir.” Huge! Stir! It also notes that the entire Bush clan was enraged. Newsweek would surely love to cause another huge stir and to enrage the Romneys, but it’s doubtful they would even notice any more.